There is not one piece of equipment more integral to the backpacker than the eponymous backpack itself. Given this fact, it seemed only right to ruminate briefly on what makes a good backpack, a well-packed backpack, and a backpack likely to confer happiness onto its wearer. These thoughts are arranged here in no particular order, and although they are written as tongue-in-cheek commandments, remember that your mileage may vary. In our pre-trip research we uncovered a telling pattern: everyone seemed to complain that they carried too much stuff around with them, and no one seemed to complain that they carried too little. With that in mind, we specifically bought smaller-sized backpacks – Jessica's in particular was smaller than the daybags of many of the other travelers we met. Going with smaller bags forced us to be more disciplined about what we carried with us, and in hindsight it was one of our best early decisions. Having nice small bags meant we could walk further with our packs on. It meant we could stick them under our seats on buses rather than having to toss them up onto the roof. Most of all, though, it really felt good. We'd glow whenever another traveler commented admiringly on how small our packs were. You will too. So don't buy that 6,000 cubic inch monster. Don't sentence yourself to spending your trip with 25+ kilos of crap you don't need strapped to your back. If you have a 2,000 cubic inch bag, you'll wish you had 2,500. If only you just had 2,500 cubic inches, you'll think, you'd be able to take everything you need. But if you have a 5,000 cubic inch bag, you'll be just certain that you can't possibly get by on less than 6,000. You will always want just a bit more room than you have. But the inverse of that is even more important: you will always fill your backpack, and be sure that you need everything you have in there. But now you're looking at your packing list, and you're worrying you've made a mistake. How on earth are you going to fit it all? The answer is simple: you aren't. I can't help but chuckle when I look back over our initial packing list. If we'd packed every single thing on that list, we'd have filled five backpacks. But since obviously that wasn't an option, we had to whittle it down to just what we could fit (see commandment #2). Books, magazines, notebooks: These are the worst offenders. I guarantee you you'll be able to cut deeply into what you're bringing here. Shoes: This one will kill you if you're not careful. You aren't going to need more than maybe just a pair of sneakers and a pair of sandals. Really. I know, you don't believe me. You're planning on dancing the night away and so must take at least one pair each of low- and high-heeled shoes. Go right ahead. You'll be mailing them back home in a month. Clothes: I can't tell you how much clothing you'll need to bring. I can only tell you that the answer is somewhere between 5% and 40% of what you feel is the absolute minimum you can afford to bring. After our first purge (see commandment #5) a month in to the trip, I was left with two pairs of pants (that zipped into shorts), three shirts, a swimsuit, three pairs each of socks and underwear, and that was it. The pants lasted me the whole trip (thank you REI! ), while the shirts would wear out every couple of months and be replaced by new ones (see commandment #4). Now, these cuts are going to be painful. They were for us. And you don't need to be too religious about it. 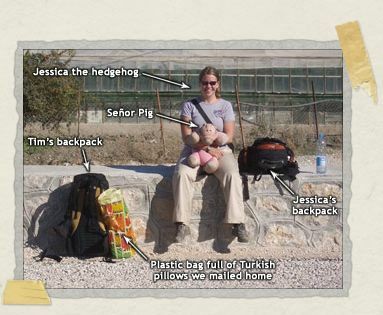 We did, after all, travel the world with a large stuffed pig. This commandment has two purposes. The first is to remind you that you don't need to buy a full-year (or however long your trip is) supply of anything before stepping onto your first plane ride. Just bring along one tube of toothpaste. When you run low, buy another one. I don't care where you are in the world, you'll come across a tube of toothpaste for sale somewhere. Note: For most medications, you'll be able to find a generic or another brand if you can't find exactly what you're looking for. These are usually identical to what you're used to, but with different inactive ingredients. For any medication you've been taking daily for a long time (ie, birth control), you may not want to chance the side effects that could come from switching brands. In this case, you may want to consider leaving half of it or so with someone at home, and having them mail it to you along the way. However much you whittle your stuff down, you'll still probably start off with more stuff than you need. I recommend monthly purges. Every four weeks or so, sit down and go through everything you're carrying with you. Set aside every single thing you haven't used in the past month. You'll be surprised how big that pile is. Now, start going through this purge-pile. For each item ask yourself, "Do I really need this?" Be brutal. You spent a lot of money on that electronic pocket translator, but you've never once pulled it out. The idea of catching your own fish with that little line-and-hook kit is romantic, but you always seem to buy something at a food cart instead. You swear the very next place you're going is the one where you're going out dancing in your dress shoes. Purge 'em. Send them home, sell them, give them to someone else. Be ruthless. When backpacking, you're going to be carrying your whole world around on your back. It just doesn't need to feel like it. I Am Number 1 ! Wow. You commented less than thirty seconds after this post first went public. I am agog. I learned nearly all of this on a 10 day motorcycle trip from Seattle to Mt Rushmore and back. I think most people forget you can 1) wash (sic) along the way, and 2) buy more toothpaste (etc) on the road. In hindsight, I would have bought a camera that only requires a charger cord, and not batteries that needed replacing– those AREN'T easy to find all the time, and not light to pack. Glad to see another post– I was just thinking about you guys last night. Wondering if wedding plans are in the works yet? An update! At long last, my obsessive site checking has paid off! I usually haul an over-stuffed duffle bag down to my parents for mere overnight trips. World-traveler material, I am plainly not. I felt something was missing from my life. Ahhh… vicarious fulfillment! I missed this entry before, but these are very good packing tips even if you're just taking an ordinary vacation. Couldn't agree more, with one exception: water purifier. I hate the bottled water industry with the fire of a thousand suns. I think there is already far too much plastic in the world, and purchasing 2-3 bottles of water every day for a year certainly doesn't help. I'll be traveling with two Nalgenes and a Steripen. Less environmental impact = happy traveler! I'm with Nico on this one. Yes, clean water is readily available, but I've been saddened on my travels by huge amounts of plastic trash littering up would-be breathtaking views. If we're gonna see the world, we should do our part to make sure it's worth seeing later on. Also, I'd like to brag here that I hoofed it for 4 months from Guatemala to Costa Rica and back up to the Yucatan with nothing more than a regular old Jansport book bag!I had some undies, a change of clothes, a raincoat, swim suit, a hoodie, Converse All Stars, and toiletries. I felt so free! Also, I'd like to brag here that I hoofed it for 4 months from Guatemala to Costa Rica and back up to the Yucatan with nothing more than a regular old Jansport book bag! Congrats! Isn't it an amazing feeling? On our trips since we've been home we've taken to just bringing our little black bags with us (they're about the size of the Africa Lonely Planet book)…and it's been fun to see the customs officials always give us a double-take. "Where is your luggage? Wait, that's your luggage?!" And you are totally right – it is incredibly freeing, isn't it? Tim and I definitely hear what you and Nico are saying about bottled water, that's part of the reason he wrote the caveat at the beginning of the water purifier section ("I know, this part is sacrilege") and it's also why he mentioned the post is in part meant tongue and cheek. There are always going to be certain things that some travelers find indispensable and that others do without. We rarely will suggest that one way is the way for everyone. It really comes down to what each individual traveler feels is best for them/their travels and how – in some cases like recently with water purifiers – those choices might fit in with their general approach to life, like being environmentally aware. For our part, we're green conscious at home and we do our best when we're away from home (though I've seen some folks online argue that any domestic/international travel isn't a green decision either given huge airplanes, etc, etc)…but we still use bottled water when we travel internationally. That said, we also still have our little water purifier and it is awfully tiny (and would fit perfectly in the "pen" section of my black bag!). So we'll have to see what our next travels bring. I just discovered your blog through the lonely planet thorn tree forum. The title of it made me laugh out loud and I had to click on it. Hey L! Thanks so much for dropping by! Tim and I will be the first to admit that we enjoy packing super light, but that it might not be for everyone. I mean, after all, we did travel with a giant toy pig! So if two water purifiers brings you joy, then I say go for it. It's all about what makes each of us happy (and helps us feel most comfortable) when we hit the road.